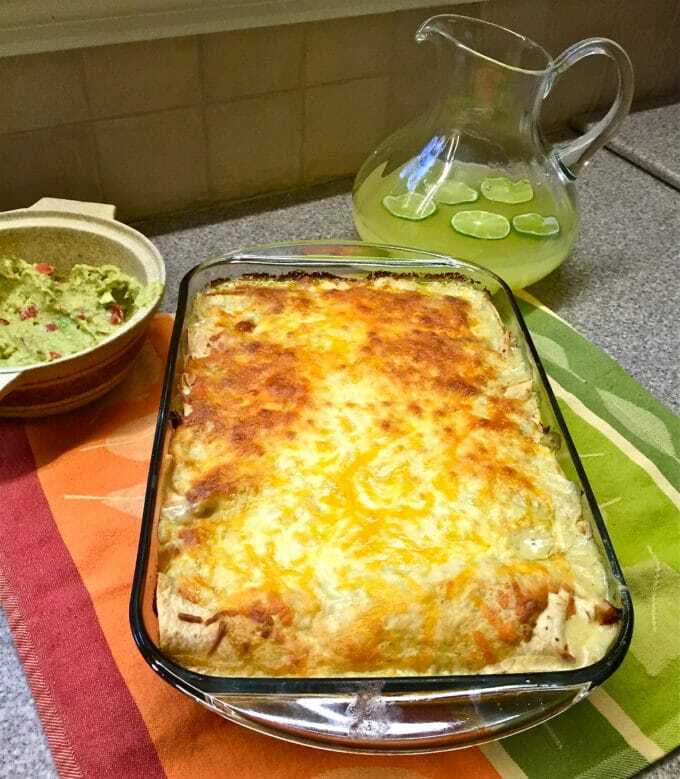 Easy Tequila Lime Chicken Enchiladas – doesn’t just hearing the name make you hungry? 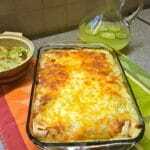 Well, wait until you taste this delicious, easy chicken enchiladas casserole, you will become a believer! This recipe for Easy Tequila Lime Chicken Enchiladas, is somewhat different from authentic chicken enchiladas and features shredded chicken marinated in tequila, lime juice and a “secret” ingredient, brown sugar. All of this sweet deliciousness is then wrapped up in a tortilla along with some cheese and topped with an out-of-this-world salsa verde sauce, Crema which is Mexican style cream and yes, even more, cheese. Take my word for it; this dish is really, really, really, good! It will make you want to celebrate Cinco de Mayo all year long. Ole! I did a taste testing with some friends the other night, and everyone loved them, even coming back for seconds. Then my husband and I had leftovers for dinner last night, and they were as good if not better. Don’t you love it when a plan comes together, and you have enough of a great dish for leftovers the next night, so you don’t have to cook! I have to confess, as much as I love to cook, I also love it when I don’t have to cook! Love enchiladas? You might also be interested in these other yummy enchilada recipes: Avocado Lime Chicken Enchiladas, Salsa Verde Chicken Enchiladas, and Easy Honey Lime Turkey Enchiladas! They are all awesome! But, before I tell you any more about these Easy Tequila Lime Chicken Enchiladas, I wanted to let you know about a great online recipe resource called “Yummly.” Yummly is a simple recipe website where you can search through over a million recipes from across the web and save your favorites to your recipe box with one easy click of the Yum button. You can also keep all of your favorite recipes in one place with their powerful “Add Your Recipe” tool. You can add any recipe from my blog or other blogs to your recipe box with one click of the Yum button at the bottom of this page. No more separate recipe boxes on major websites, now you can save them all in one place. All you have to do is go to the Yummly Website, install the Yum bookmarklet into your browser and you can start “yumming” into your recipe box from any food-related website. That’s it; it’s free, and it’s awesome. How to make Easy Tequila Lime Chicken Enchilada recipe. If you’re ready to get started, then gather your ingredients and let’s get cooking! 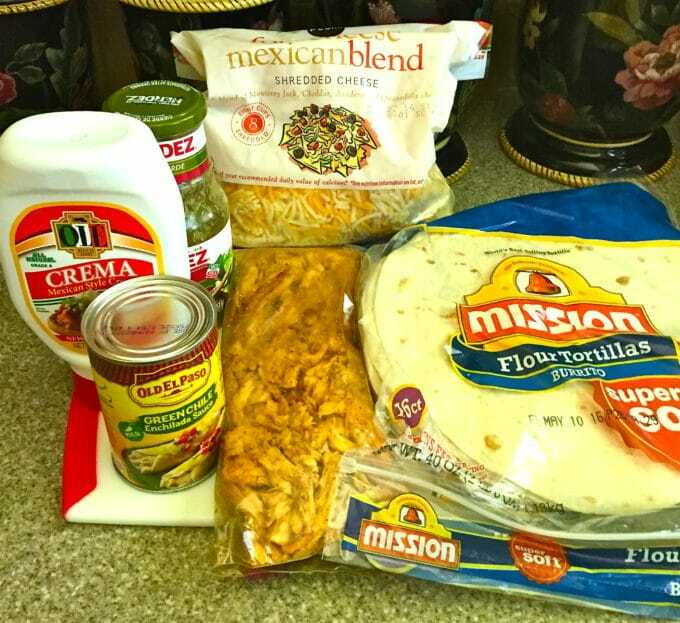 The ingredients you will need are tequila, brown sugar, lime juice, chili powder, garlic powder, chicken, flour tortillas, Monterey jack cheese or a Mexican blend, green enchilada sauce, salsa verde, and Crema which is Mexican cream. (If you can’t find Crema, you can substitute heavy cream. I know it sounds like a long list, but it comes together quickly. The chicken does need to marinate for a minimum of 30 minutes, and it’s even better if it can go longer, so plan accordingly. Place the cooked and shredded chicken in a plastic storage bag and pour in the marinade making sure all of the chicken pieces are saturated. Let the chicken marinate in the refrigerator for a minimum of 30 minutes or up to 24 hours. The longer the chicken marinates, the better. Drain the chicken mixture and reserve any remaining marinade. 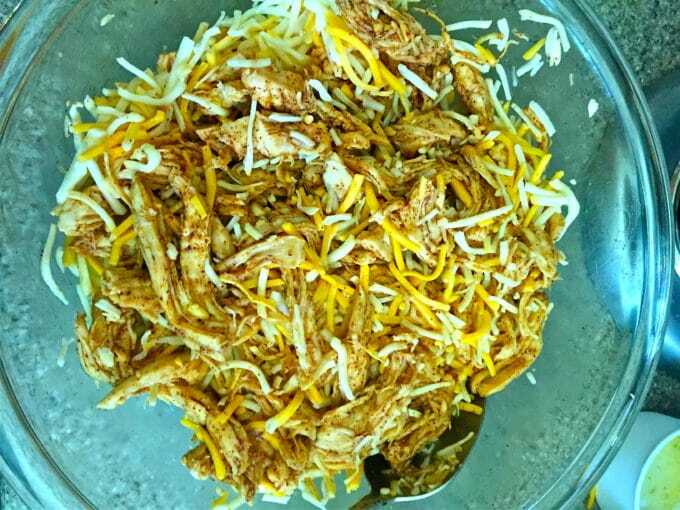 Mix the chicken with 3 cups of the shredded cheese. Put a heaping 1/2-cup of the chicken mixture down the center of each tortilla and roll up as tightly as you can. Place the rolled tortillas in your baking dish seam side down. Repeat for the rest of the tortillas. You should be able to fit eight enchiladas in the dish. If you have any leftover marinade, mix it with the sauce you made earlier. Pour this mixture over the enchiladas and top with 1 cup shredded cheese. Tequila Lime Chicken Enchiladas features chicken marinated in tequila, lime juice and brown sugar wrapped up in a tortilla with lots of cheese and salsa verde. When you are ready to cook, preheat your oven to 350 degrees. To begin, mix 1/2 cup of the green enchilada sauce with the salsa verde and Crema. (You can substitute sour cream thinned with a little cream or heavy cream for the Mexican Crema. 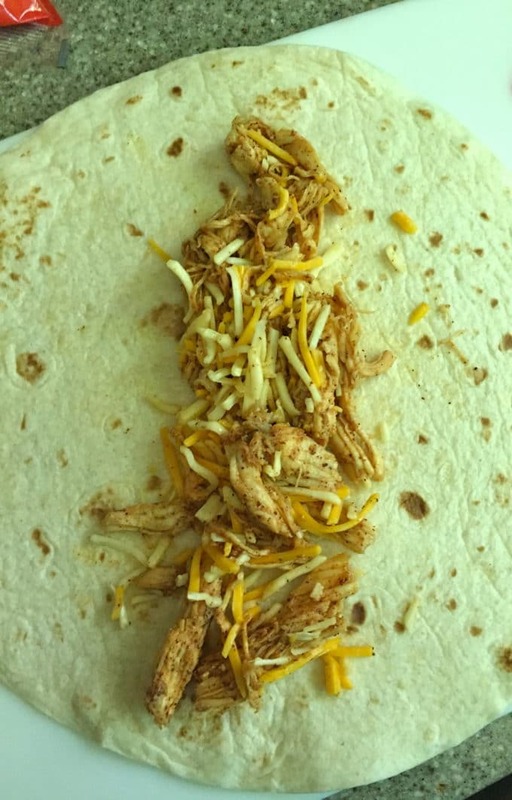 Put a heaping 1/2-cup of the chicken mixture down the center of each tortilla and roll up as tightly as you can. Place the rolled tortillas in your baking dish seam side down. Repeat for the rest of the tortillas. You should be able to fit 8 enchiladas in the dish. I usually use bone-in, skin-on chicken breasts. To roast, I brush them liberally with olive oil and season with salt, pepper and garlic powder and then roast for 40 minutes at 350 degrees. I also usually cook at least double or triple how many chicken breasts I need and then freeze what I don't use to use at a later time. To save time, you can also use a rotisserie chicken from your favorite grocery deli. 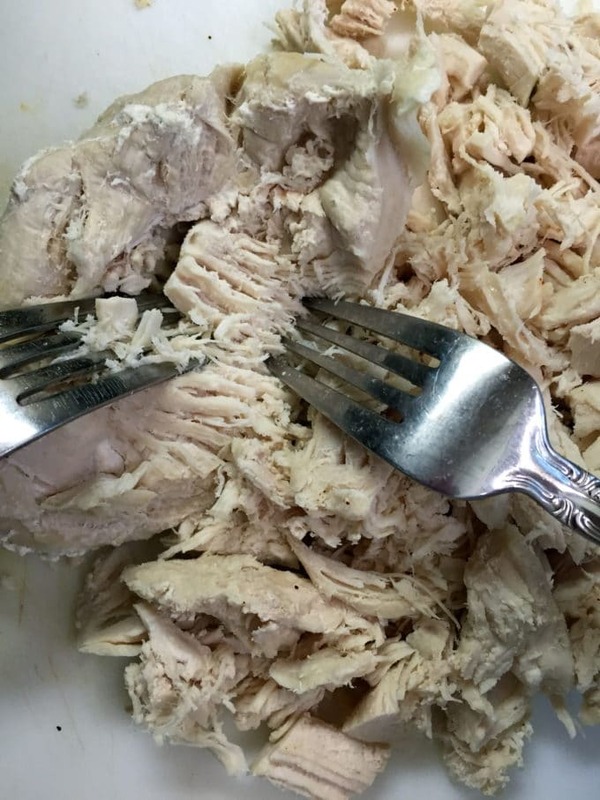 To shred, simply get two forks and pull the meat apart. To make ahead, cover the unbaked casserole and refrigerate for up to 24 hours or freeze for up to 2 months. When ready to bake, let it thaw in the refrigerator overnight and bake as directed. Made this tonight and it was a solid hit. I too would like to know if you think it would freeze well. I’m so glad you enjoyed it. Yes, it does freeze well and because it’s just my husband and me, I almost always divide it in half and cook one casserole and freeze one casserole for later.